Describe and compare the four sets of data. Are the four grades similar? Different? 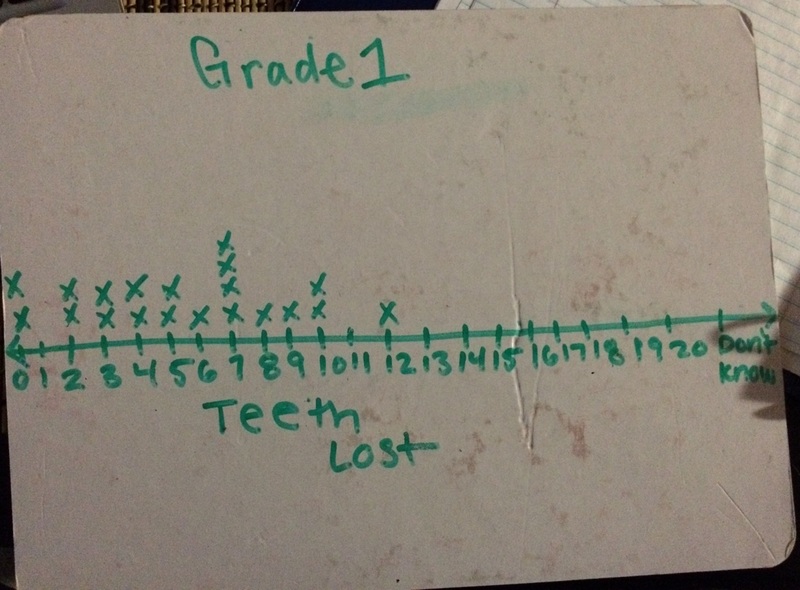 The four grades of data were all designed according to what students said about how many teeth they had lost. The sets of data did not have a whole lot in common however sets of two are comparable. 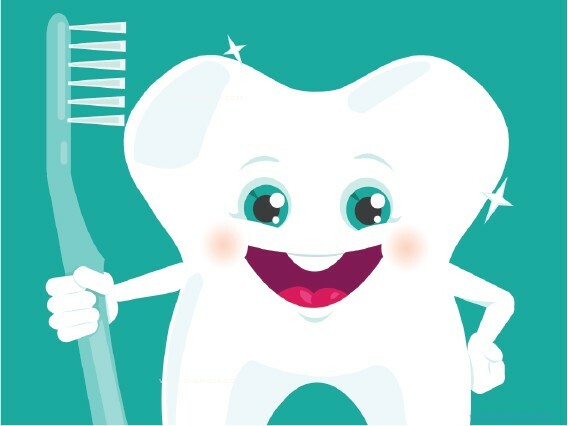 Both kindergarten and first grade have students with lost teeth beginning at 0, whereas grades 2-3rd did not. Also, grades 2- 3 had teeth losses higher than 12. The data sets are different primarily due to the ranges of teeth lost in each set. 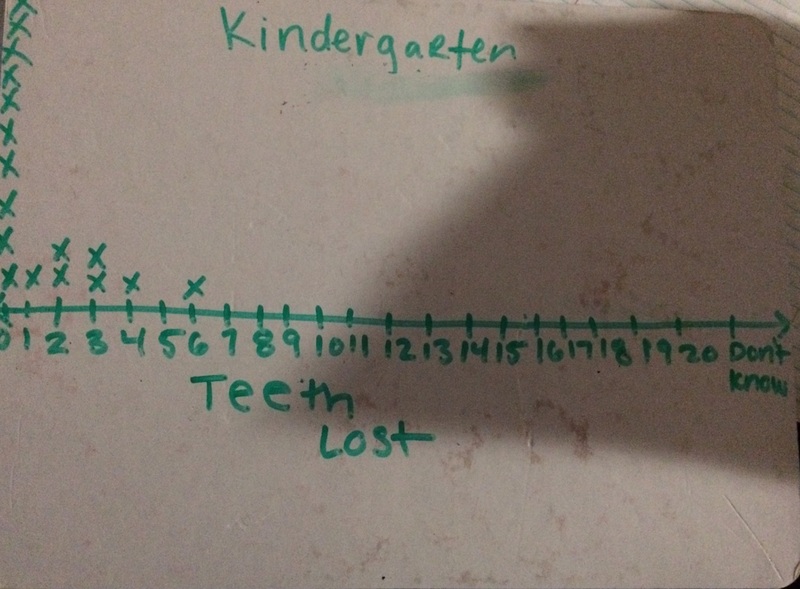 For example, kindergartners had 10/17 students choose 0 teeth lost where as third grade had a variety of results. If just the mode for each grade were reported to you what would that tell you about the data? What wouldn’t you be able to tell? If only the mode was reported for each data set I would only be able to tell what the most number of teeth lost were in each grade. I would be able to tell the differences between the grade levels easily. However, I would not be able to tell how many students participated in the data or how many other teeth numbers were involved. 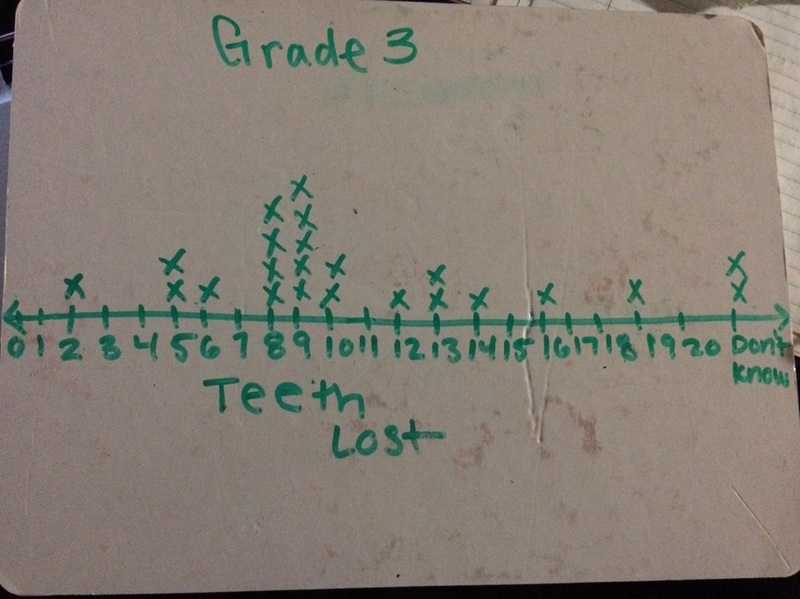 Find the median number of teeth lost for each grade. If just the median for each grade were reported to you, how would that help you compare the grade levels? The median would help a reader visualize that students in kindergarten have primarily lost no teeth and gradually lose more teeth as they advance in grade level. 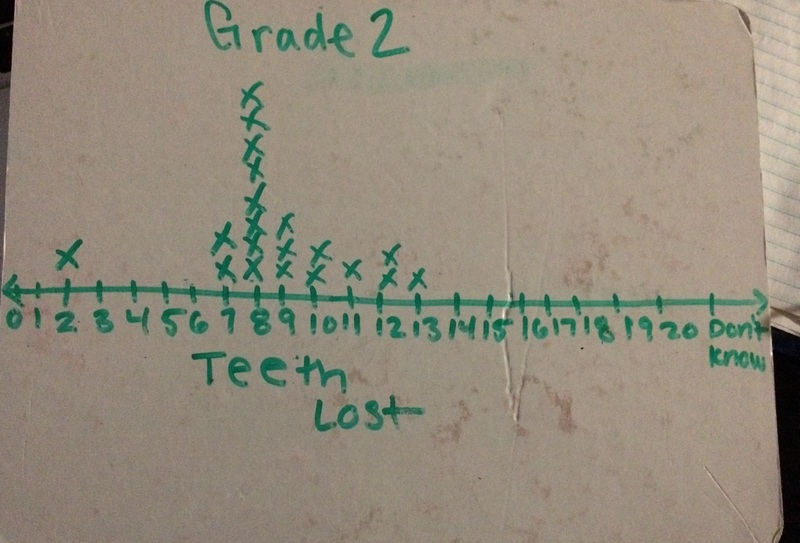 By third grade, some students have lost up to 9 teeth. If just the median and the range were reported to you, what could you say about the data? If just the lowest value, the highest value, and the median for each grade were reported, what could you say about the data? Would these statistics give you an adequate picture of the data? What would you know about the data? What wouldn’t you know? If only the range and the median were given the data would not make much sense to a person who did not work with the prior data. The median does not give much depth as to what other teeth amounts students have lost. When comparing the data with the median and the range you have a bit more understanding as to how many teeth were lost in each grade. If the lowest number, highest number and median were given there still would not be a very adequate amount of information for this data. Unfortunately, these numbers do not give much of a visual as to how many students were involved in this collection or how many students chose a certain number of teeth lost. *My data seems incomplete due to the two third grade students opting to not knowing their amount of teeth lost. How can I make such answers more probably to my data? This statement is surely an eye opener to an incoming new teacher. Unfortunately, considering all of the standards we have for students, concepts of data can be quite complicated. Students have a hard enough time explaining themselves in kindergarten and to consider them doing data seems like a lengthy process. I read this statement several times in order to grasp the true meaning behind it. As teachers, we are accustomed to recording data regularly. However, to a child so young it is important to remember that students will be learning this freshly. Using the statistical process would seems to be a working way for students to wrap their brains around the true meaning of data. The most important take away is that students do not see data as just numbers on a chart. Chapter three of the textbook was very refreshing on the different forms of data collecting and which is best understood by grade level. I was also very intrigued by the success of relating data to children’s every day life such as using favorites to collect data. I learned that there are several stages in data collecting: concrete-pictorial, pictorial abstract and abstract. In the concrete pictorial stage, students see data as pictures such as the number of favorite bananas that are the class favorite. Pictorial abstract moves on to having something other than a picture represent the data such as squares. Finally, the abstract stage was a way for students to see data represented by numbers and bar graphs. All in all, data collecting and representing is a process that helps students develop a meaning behind the numbers. What are some ways that we can enhance our students early experiences with data to ensure maximum understanding? It is important to teach children data recording in a meaningful way because students need to be interested and engaged in learning. Students are likely to respond to things that relate with them such as the textbook mentioned “favorite things”. It is also important for students to understand that the question that they are researching need to be specific and defined in order to collect accurate data. Overall, students learn better if data recording means something to them and if they are truly interested. Case study 4: Students in this case study became frustrated over the fact that their data was not matching up correctly when they physically grouped themselves over the question “Did you have milk for breakfast?” This case study showed a prime example of why it is important for the questions being asked is defined specifically to what you are trying to find out. Case Study 5: Digging deeper from the case study above, students were learning to be specific when defining their questions. Students soon realized that some people would define things such as “moving” differently. The children decided that they must be so specific in their question so that they can discover what they really want to know. Case study 6: In this study, two students found their selves in a debate of how to ask a specific recording question. It is hard to define questions so they meet everyone’s interests and needs. This case study provided a clear example of deciding what is the most important elements to a question. * What are some ways that we can accommodate for students that have different interests and expectation for recording results? Posted on February 2, 2015 February 2, 2015 by moore4her	Bookmark the permalink. I really enjoyed going through your post and seeing what you learned and how you recorded the data. To ensure that students are giving accurate answers, it is important to make sure that the question is specific. If the question is specific and students are still answering “I don’t know”, try to help them. Maybe count their teeth with them or try to trigger memories of losing their teeth. Now, some ways that we can enhance our students early experiences with data is to relate and connect it with life experiences that they are going through. If students have different expectations for recording results, ensure them that there are multiple ways to record data and results will not always come out the way they are planned. We cannot predict what people will answer, but we can decide on what kind of way to present the data. I think that you did a great job and learned a lot from this module. Recording data can be difficult, especially for elementary education.